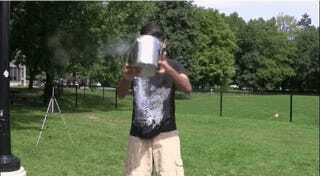 Canadian chemist Muhammad Qureshi has taken the viral ALS ice bucket challenge to its logical conclusion by dumping a bucket of liquid nitrogen over his head. Undeniably, it was a very dangerous thing to do — but Qureshi did have some basic chemistry on his side. "So a lot of you are saying that since this is very dangerous, won't I freeze, won't I get frostbite?" noted Qureshi in the video. "Well, thankfully, there's something called the leidenfrost effect, which will save me." The Leidenfrost effect is a phenomenon in which a liquid, in near contact with a mass significantly hotter than the liquid's boiling point, produces an insulating vapor layer which keeps that liquid from boiling rapidly. This is most commonly seen when cooking; one sprinkles drops of water in a skillet to gauge its temperature—if the skillet's temperature is at or above the Leidenfrost point, the water skitters across the metal and takes longer to evaporate than it would in a skillet that is above boiling temperature, but below the temperature of the Leidenfrost point. The effect is also responsible for the ability of liquid nitrogen to skitter across lab floors, collecting dust in the process. It has also been used in some potentially dangerous demonstrations, such as dipping a wet finger in molten lead or blowing out a mouthful of liquid nitrogen, both enacted without injury to the demonstrator. Okay, cool — but Qureshi could have hurt himself badly if blobs of the liquid nitrogen got stuck onto his skin. And indeed, as the blooper segment at the end of the video illustrates, the stunt did not always go as smoothly as planned. It's also worth noting that liquid nitrogen is an asphyxiation hazard, though in this context not so much. It brings to mind the stupid Jägermeister stunt from last year when liquid nitrogen was poured into a swimming pool. I know it's cliche to say this, but don't try this at home, folks. Seriously.